The victorious BGS team in action. 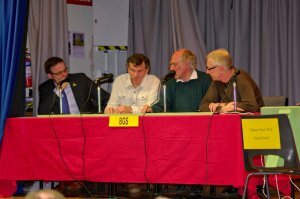 In front of a packed Village Hall, the British Geological Survey team of Jim Riding, Keith Ambrose, Rob Armstrong and David Bailey were triumphant in an exciting final of the 2012 Village Quiz on Monday, 26th March. Earlier, both semi finals had been close affairs which were only decided by the speed and knowledge of the winning teams on the bell and buzzer. In the first semi final, BGS had to overcome stubborn resistance from the Keyworth Dramatic Society team who were still recovering from the success of their latest production which finished less than 48 hours before this big match. Indeed, one of the Dramatic team, David Wingfield, had been "killed" three times only last week. The second semi final saw the Twinning Association team of Norman Logan, Steve Collishaw, Jean Ainscough and Stuart Bailey come from behind in the final round against the Four Feathers badminton players. In the semi finals, the teams had to deal with the usual team and individual rounds as well as a round of "tenners" where they had 30 seconds to come up with a list of 10 answers on diverse subjects such as Roads in Keyworth beginning with a B, and the 10 London Olympic sports which will use a ball. As if that wasn't enough, they also had a picture round entitled "Look up, me duck" where they had to identify well known Nottingham buildings from just a picture of the top of the building! While refreshments were being served by the Twinning Association (not the players, but their friends), the audience had fun trying to identify some of Britain's top branded products from a photo of just a small part of the product name, in the Audience Quiz. The final itself saw the Twinning and BGS teams battle it out over six rounds in a match where the lead changed hands four times. In this game, the players had to identify household items just from their silhouette, answer a Sound round covering a wide variety of music, and then face a minute in the "black chair" in a mini Mastermind experience. Twinning went into the final bell and buzzer round with a seven point lead but BGS pulled out all of the stops to claim victory in the last few questions. 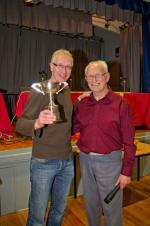 The trophies for the finalists were presented by none other than the man who started the competition, Derek Oakley. 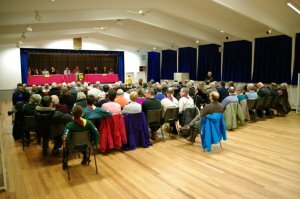 In an amusing speech, Derek told us that he could never have imagined that the Village Quiz would still be going so strong in its 37th year – and invited everyone to come back for some more fun quizzing next year. The Village quiz organisers are always up for a challenge and this year, on the day before our Grand Final, our lovely scoring ladies and our question setters took part in the "Sport Relief mile" to try and help others less fortunate than ourselves. Our lovely scoring ladies all floated around the three mile course, and our question setters (who both have bus passes!) ran the six mile event non-stop to raise money for a great charity. Over £300 has been raised for Sport Relief including almost £100 from the quiz audience and teams. We've been amazed at the generosity of the audience and, if you would like to make a further donation to this wonderful cause, please contact John on 9374833 or email to keyworthquiz@hotmail.co.uk.